Automotive Air Intake Manifold Market size was valued at over USD 33 billion in 2016 and its demand is projected to cross 150 million units in 2024. Substantial vehicle production across the globe will primarily drive the automotive air intake manifold market over the forecast timeframe. Large scale usage in passenger cars, light and heavy commercial vehicles will lead to increased revenue generation. The global automobile production is expected to cross 135 million units over the next eight years, thus escalating the industry demand. 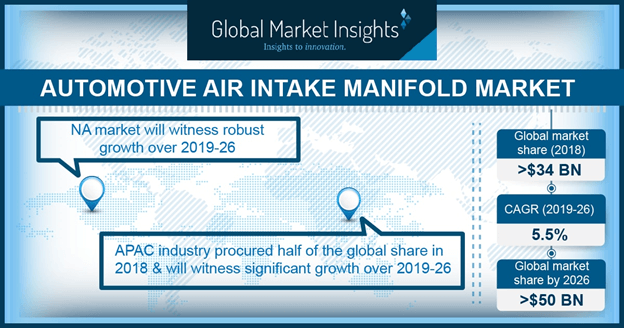 High acceptance from passenger vehicles will have a positive impact on the automotive air intake manifold market growth over the forecast timespan. 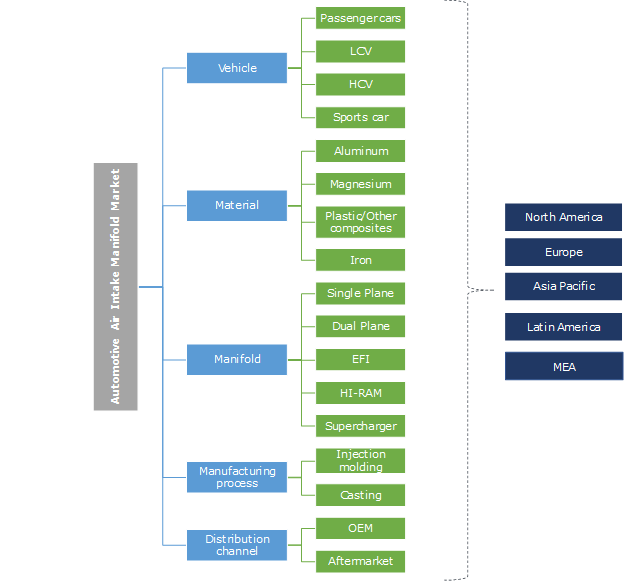 Emerging economies such as Indonesia, China, and India have witnessed a tremendous rise in passenger cars production, thus supporting the high revenue generation. Stringent regulations and norms regarding CO2 emissions and fuel economy will further support the industry growth till 2024. However, significant overhead expenditure for manufacturers coupled with low product replacement rate may hamper the industry growth over the coming years. The automotive air intake manifold market players focus on the usage of advanced products and regular innovations as it enables the manufacturers with benefits such as low density, less energy consumption, weight reduction up to 15%, enhanced acoustic behaviour, and cost-effective solution. Large scale manufacturers are shifting their preference towards the tier-1 suppliers for designing and manufacturing of the customized components as per their vehicle design. Qualitative and technological gap represents a barrier for new competitors in the automotive sector. Air intake manifold demand for passenger vehicles (PCVs) reached 69 million units in 2016. This segment expected to exhibit the highest revenue share over the forecast timeframe. It can be attributed to rising production of these vehicles across the globe, especially in the emerging economies. Rapid urbanization coupled with high demand for sedans and SUVs is anticipated to support the automotive air intake manifold market dominance. The 100% FDI encouragement for the automobile sector in the automatic route is projected to fuel the manufacturing sector, therefore escalating, the automotive air intake manifold demand till 2024. Heavy commercial vehicles (HCVs) is anticipated to grow at fastest CAGR over 5.7% for the next eight years owing to rapid industrialization in developing countries that has led to increase in international and domestic transportation activities. The road transport, being the cheapest and most convenient method of goods transportation, has resulted in the increased demand of these vehicles across the globe, further escalating the automotive air intake manifold market growth over the forecast timeframe. Aluminium is projected to dominate the automotive air intake manifold market over the forecast timeline owing to the stringent fuel economy standards. The advantages such as resistance to corrosion, strength and light weight will support the high revenue generation. Additionally, high usage of aluminium manifolds in premium cars will further escalate the industry demand over the coming years. Magnesium is poised to grow at over 6% CAGR over the next eight years owing to the provision of numerous benefits such as light weight, higher recyclability and similar corrosion resistance as aluminium. Magnesium helps in weight reduction in vehicles that results in enhanced energy efficiency. Due to its advantages, it is highly used in high performance vehicles and sports cars, thus supporting the automotive air intake manifold market growth over the next eight years. Dual plane manifold demand crossed 66.9 million in 2016. The segment is anticipated to capture significant revenue share in the automotive air intake manifold market by 2024. Rising production of passenger and heavy commercial vehicles will primarily drive the dual-plane manifold market over the forecast timeframe owing to its high usage in these cars owing to their less requirement of acceleration and speed. It provides enhanced balancing of the airflow from cylinder to cylinder that has led to shift in focus of the industry players towards dual plane manifold, further supporting the industry dominance. Electronic fuel injection (EFI) is set to grow at the fastest CAGR over the forecast years. The substantial growth can be attributed to its benefits such as accuracy and precision that result in high fuel efficiency. Its features including lower fuel consumption, enhanced reliability, excellent starting, and easy compatibility with heavy fuels will further escalate the automotive air intake manifold market growth over the forecast timeframe. Injection molding is anticipated to exhibit highest CAGR over 5.6% owing to the provision of the benefits such as cost effectiveness and enhanced finishing than its counterpart. Rising usage of injection molding to produce plastics and other composites manifolds will further drive the industry growth over the coming years. Design flexibility, reduction in manual labor, and high strength are few other factors that will further support the automotive air intake manifold market growth till 2024. Growth in casting process is attributed to its high usage in metals such as aluminium and magnesium. High usage of these materials in production of manifolds will support the revenue generation. The usage of casting process for mass production will further fuel the industry growth till 2024. OEMs are likely to account for around 80% automotive air intake manifold market share by 2024 owing to increasing vehicle production across the globe. Products from OEMs are installed in new vehicles during their production and are also supplied to garages and other workshops for replacement. Increasing safety concerns along with warranty and insurance offered are the key factors driving the industry demand over the coming years. Additionally, the process for maintaining the safety standard is well maintained by the original manufacturer. This will result in identical durability, better engine service, providing safer driving conditions for passengers, further supporting the industry dominance. Aftermarket channel is poised to grow at a significant rate of 6.4% during the forecast timeframe owing to increasing accident rates worldwide along with rising damages due to these accidents and weather conditions. Aftermarket industry depends upon customer preference towards quality and cost of product. Cost effectiveness as compared to OEMs is another factor driving the growth of aftermarket in automotive air intake manifold industry over the next eight years. Asia Pacific is projected to register substantial revenue share of 45% over the forecast timeframe owing to rising automobile production across the region, especially in emerging economies including China, India, and Indonesia. Availability of cheap labour and raw materials will further fuel the regional growth of automotive air intake manifold market till 2024. China, India and Japan are leading in light weight commercial vehicle production as it is cost effective and is affordable to a large part of the population. India remains the world’s sixth largest automotive manufacturer in volume units. Europe automotive air intake manifold market growth is attributed to well-developed automotive infrastructure across the region coupled with presence of established players in the developed countries such as Germany. Moreover, rising production of passenger cars will escalate the regional growth. Röchling Group, Magneti Marelli S.p.A, Tenneco Inc., MAHLE Gmbh, Aisin Seiki Co. Ltd., and Keihin Corporation are among the prominent players in the automotive air intake manifold market. Other notable players include Sogefi S.p.A, Mann+Hummel, Toyota Boshoku, and Mikuni Corporation, etc. Industry players are focusing on geographical expansion for strengthening their foothold. For instance, In May 2016, Röchling Group commissioned its first plant in Mexico. As the country is ranked seventh in the global automobile market, it was necessary to construct a new facility to expand its reach. Later that year, in august, the company established a joint venture with an automotive component manufacturer, Starlite Co. Ltd. in Japan to strengthen the international profile and increase the product penetration in Asia Pacific. New product development is also witnessed as an important strategy adopted by the industry participants for increasing their visibility and customer base. For instance, in November 2016, Sogefi introduced an air intake manifold to the automotive industry made from polypropylene 30% reinforced glass fiber for increasing the revenue generation. In 2014, the company introduced its first in-house designed active long runner/short runner air intake system to the industry for enhancement of its product portfolio. Automotive air intake manifolds are implemented in the engine assembly for facilitation of air and fuel distribution for internal combustion. It finds its applications in automated control fuel injection principle and conventional prototypes and exists since the advent of automobiles. The air intake manifold involves single air inlet (plenum) for passage through several runners or tubes of combustion cylinder. Substantial vehicle production across the globe is the key driver for the industry growth. Favorable trade policies have enhanced the imports and exports of the product globally. The proper and timely introduction of the product to distributors increases the chance of a successful product launch in the market. Technological advancements such as vibration welding and multi-shell technology are anticipated to induce immense potential to the automotive air intake manifold market size till 2024.